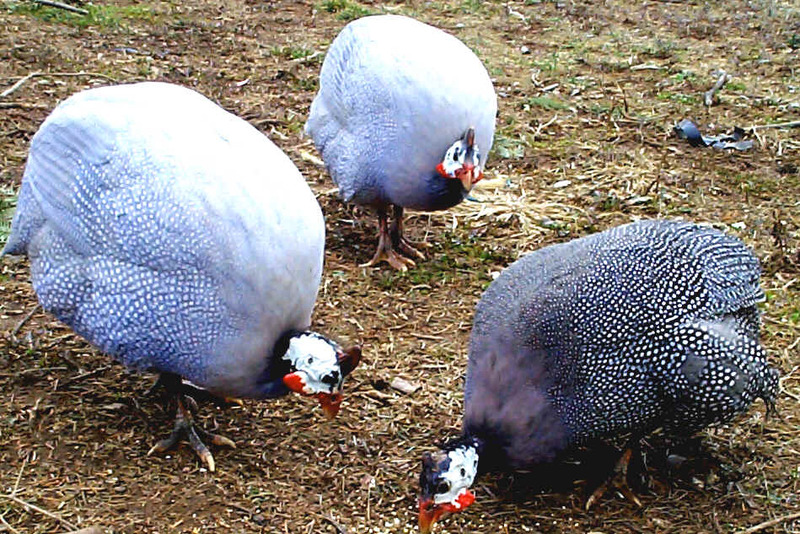 Look for Guineas at the movies- 2 classic spots- 1) Disney's "The Lion King" and 2) with Cornell Wilde in "The Naked Prey"
When you come to our stand or are driving by, you might see some of our Guinea Fowl. Hopefully they will not be in the road as they have, on occasion, wandered. My apologies to anyone whose path they are blocked. They do as they please and not what I say. Take a minute and find out a little more about them. These creatures are so bizarre looking, you have to like them. They have a prehistoric or alien look to them. 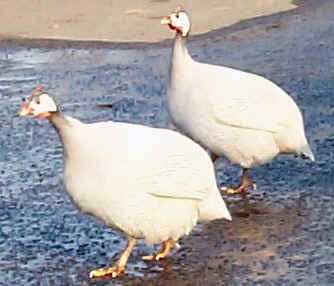 They are about the size of a pheasant or medium sized chicken. There are several color variations. The most common is called "Pearl", which is gray with small white spots. Next most common is white. Other colors include "Royal Purple", "Lavender" or . We have pearl and lavender. The lavender has small white spots on a light lavender body. Guinea's heads are bare with a white skin. They also have red wattles (those things that hang down from their throats), a red growth at the top of their beak, and a horn-like bump on the top of their heads. They originally hail from Africa where they form large flocks in grasslands. They move about constantly, always feeding. They eat some seeds and grains but are mostly bug eaters. They are reputed to be good tick eaters and have been used in parks and public areas for this reason. The Guinea hens have a distinctive call (sounds sort of like "put-wheat or buck-wheat") that probably evolved to call the young to them in the grass. Both male and female have a very distinctive alarm cry which they sound at the slightest disturbance. This could be someone walking, a dog, a hawk, a car or truck, or any thing that is different to them at that moment in time. Again, this alarm probably evolved in the grasslands when there was a great benefit in the flock being warned of danger as early as possible. They are great watch birds, sometimes too good, as any one who has ever been near a screaming, chattering group can attest..
5/13/00 One problem has arisen with these guinea fowl. They have developed a taste for hosta, mainly blue varieties, but they have sampled all varieties I grow. 4/04/01 We were down to three guineas. Lousy luck, they were all males. But they were still very entertaining. Another male disappeared a month or so ago. There have been a number of hawks around. Mid morning a girl comes into the store who found a pearl guinea, same color phase as the one we lost. She lived in Clark by the reservoir, which is fairly close. I thought it might be the one we lost and she wanted to find a home for this one. She brought it in and we let it out of the carrier she had it in. Right away we could tell that it was not the same as the one we lost. The birds adjusted well together and there was no fighting for dominance that I had expected. We watched as they browsed together. Soon they browsed right off our property and down the road. We had several repeated sightings of them during the rest of the day but could not find them when we went to look for them or couldn't chase them back. After finishing work for the day, another friend stopped to say that they were in his horse corral. I went over to try once more. I felt if we could get them back on the property this late they may roost and would stick around in the future. As I pulled up to his gate. I could here a distinctive call. The new bird was a female. She had lured my normally sedentary birds into a road trip. We caught one and chased the rest back to the farm where hopefully they are roosting now. It's been two weeks. My guineas have been roaming all over the neighborhood but they seem to be coming back to roost here. 8/22/01 They eventually came back. The hen nested once in Spring and no results. She nested again in June and hatched 5 chicks in late July. Two were lost during the first week. The other three are starting to feather out nicely now. Only problem the hen is starting to roam. One of the males was hit over the last weekend. Yesterday all the young ones gave my heart a test while crossing the road. The hen is starting to leave the young behind a lot as she roams. We will here the chicks calling in distress from the top of the mulch pile or other high point while the hen is no where close. Here are a Guinea hen links if you would like to learn more about them. Here's Frit's Farm's page on Gardening with Guineas. 7/25/06 Sorry to say we just lost our last guinea here two days ago. This road I am on has changed greatly in the last ten years and the increased traffic and the speed which at which they travel have been hard on the guineas and I am facing the reality that I may have to give them up. I do not want to cage them as their wildness is one of my favorite characteristics about them.